Sorry about such a long blurb, I had tried cutting it down but it needs to all be in there. I don't know if you've noticed but I wear colour. I don't like neutrals and I don't like gold or any kind of warm colours. Ok, didn't. 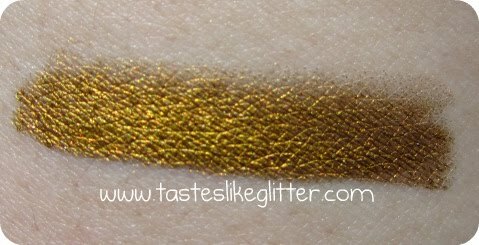 I've been looking for a gold for summer that isn't too yellow as I know it won't sit right with me being so white. I bought this knowing I would use it, even if I didn't totally love the colour. 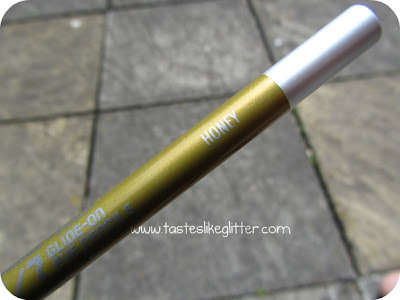 I have 10 or 11 of these Urban Decay Pencils now and I love them. And I love love love this colour! So Summer-y. They currently have 23 listed on their site, for some reason they don't have Honey listed on there. I'm determined to get all of the bright ones because I just adore them over any other pencil I've used! So why do I love them so much? They are super super soft. This one in particular, happens to be the softest out of all the ones I've tried. As it's not hard, it doesn't drag or pull on the eyelid and it leaves a smooth clean line. These can also be used all over the lid as an eyeshadow base. Once you've given them a chance to 'set' they really don't budge and that's what I love about them. I can wear them along my lower lashline without fear of them migrating half way down my face. The only thing I would say is that as these are waterproof, if you want to use them on your waterline, it takes more work to get colour pay off. Since your waterline is well ... wet and the pencils are waterproof, it's like trying to mix oil and water. 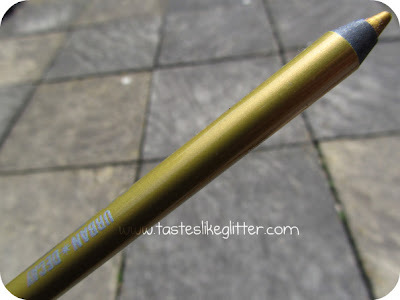 What do you think of Urban Decay 24/7 Pencils? Any you're looking to try?